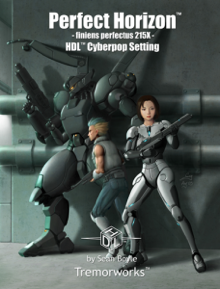 I normally tackle one product at a time; however, Sean Boyle’s line of HDL games is so entwined with one another that it’s simply easier to treat them as one massive project. The exact products I’m including are the HDL Basic Rules, Perfect Horizon, Demongate High, the HDL cards, and Lucid: Dreamscape Reality. I’ll try to separate these books for clarity’s sake, but I suspect I’ll have to trip back and forth between them on occasion. The first book in the HDL line is strictly the nuts and bolts of Boyle’s system. It’s a modest read at eighty-seven pages. Like most, my first impression of the book came through a skimming. The artwork, derived from a stable of six illustrators, seems to enjoy the fact that it rests inside a generic system’s corebook. The art ranges from martial artist dragons to anime coolness to downright comic silliness. The comic characters at first seemed odd to me, but they grew quickly on me. These doomed little cartoon avatars must suffer the various damages that could befall characters. One suffers from hypothermia while another receives an electric shock. I still enjoy seeing similar fates befall Daffy Duck and I find myself enjoying them in this book. There are some misses, particularly on the sci-fi pieces. All in all, the art holds up well both in quantity and quality. The layout, while Spartan, does the job for this kind of “hard rules” book. This, of course, brings us to those “hard rules.” The book breaks into a brief introduction, five chapters and an index. The introduction, at one page, is barely long enough to cover the heavily-treaded ground of explaining RPGs and the lot. It does what it has to do succinctly and moves right along. One key point to mention in the introduction is that the HDL cards are needed to play the game. Based on their mechanics, it’s possible to ignore them and favor dice only. You don’t want to do this though. While dice provide that exciting element of chance to the game, the cards augment both the dice and the character by providing bonuses and/or back stories to the characters. More on the cards later. Chapter One centers on character creation, specifically the stats, backgrounds, and weaknesses. Characters in HDL are built from points. Once specific areas of the character are built, secondary stats can then be calculated. There are thirteen stats in this system, which to me feels like too many. It’s sometimes difficult to tell when to stop breaking down attributes in order to gain a more realistic feel (Boyle’s purpose in making this system). A fine line exists between endurance and constitution or reflexes and coordination. All of the specifics don’t detract from the game; however, I benefit more from the less is more model. As with many games, characters are given skills, backgrounds, and weaknesses. Backgrounds in this game refers to merits rather than back history. There are twenty-five backgrounds and weaknesses in this book (and more in later supplements). While this game may demand a bit more number crunching, it’s not too difficult to get rolling with a character in less than fifteen minutes. Chapter Two (pages 17 to 42) is directly connected to character creation. In this chapter, skills are examined through a microscope. Skill points are derived from the character’s reason, knowledge, and resolve scores (along with a multiplier). There are over a hundred skills in the corebook. Skills that range from the typical (seduction) to the odd (acupuncture). As to be expected with a skill list of this side, specifics are key. One has weapon skill sets for one type of weapon, such as a pistol. Again, this returns to Boyle’s desire to have a realistic feel for his game line. I’ll go ahead and point out that the chapter headings don’t really stand out in this book, perhaps attributing to the only real layout problem I had with the book. Chapter Three (pages 43-72) offers the game mechanics, which focus on the “half die level” model. What this means is best described by using some of the book’s examples. A stat of 2 equals a dice score of 1d4; a score of 60 equals a dice score of 12d10. When skills are involved, the player rolls the Stat plus a bonus equal to the skill’s rating. What that means is this: A character with Coordination of 2 and a Knife score of 6 rolls 1d4 + 6 to conquer the difficulty (average difficulties are 10-14). This does work once you get around the strangeness of it. Again, the system seems to work harder than it has to without a great payoff. Combat follows suit by working off of eight basic steps (modifiers can make things worse). One great win for this chapter is the various tables dotting it. All of the materials for a great screen lurk right here. Tremorworks hopefully will release a screen to address this. Chapter Four is “for the narrator” and offers the kind of advice one expects to find, such as experience point allocations, adjustments for various power levels, and the like. This chapter runs for less than ten pages because, again, the author knows this is common ground for most gamers. The final chapter is reserved for equipment, something there is much more of in later supplements. A tight index wraps up the book aside for a character sheet, NPC tracker, and generic paper stand-ins (for miniature combat purposes). My take on this book is that it is clunky, but solid. By itself, I wouldn’t devote the time to create my own setting to utilize this system. Of course, the remedy to this problem is the three supplements for the game. Before I can get into those supplements, it makes more sense to address the cards. I love these cards! There are two types of cards–background cards and game cards–used in the game. The artwork on these cards is the same cartoonish style used in the corebook and it just works for them. Background cards are issued during character creation and have headings like “orphan” or “royal blooded.” Their basic purpose is to spike some creativity into the characters in an unexpected way. The game cards are a little trickier. At the start of each game, game cards are handed out (usually three) to the players and Narrator. At this point, they can be turned in for XP. They cannot be turned in at the end of the game for this purpose. Use them or lose them. The game cards provide bonuses either through mechanical bonuses or through narrative flair. Yes, they are another purchase to get the game going. They work fantastically though and can even be tweaked for use in other systems. The first setting book thrusts readers to the year 2150. Earth has gone through some major upheaval as some of the things promised to children who read Weekly Readers in the 1980s are finally made a reality. The cover art by Sy Shyng Sng rocks the setting as three cyberpunk types make their way down a darkened corridor. Jerry Kong’s sketches within the book are the book’s best points. His work generally depicts settings with fabulous detail. His character sketches are also good, but don’t shine like his environmental ones. The artwork is much better in Perfect Horizon than it was in the corebook. I also liked the various flag and corporate logos throughout the book. Coming in at a little over 120 pages, this is the second largest setting book for the line. The meat of the book breaks down into six chapters, which is bookmarked by an introduction and index. Chapter one (pages 5-35) introduces the world of Perfect Horizon. It’s a world of super power corporations, clones, cyberware, and other standard fare for such a setting. Boyle brings religion into the setting a bit more than most. This lets the game offshoot in interesting ways for groups that want to play games addressing questions like morality versus science. Politics is also detailed with merit. The details are thick in the first chapter as populations, histories, and agendas are laid out. The chapter ends with a much-useful timeline for the setting. 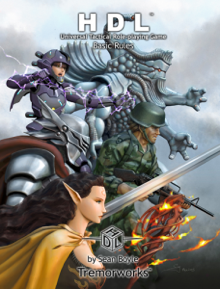 Chapter two (pages 38-48) details the characters in this setting and how to build them from the corebook’s rules. There are only five character types (four if the exclude the human type); however, the system allows for anything really. Aliens and robots can be introduced just as easily as the listed options. While the book looks like it has heavy anime influences, movies like The Island and Gattica come to mind when considering the Neutopes, a cloned race with an intriguing agenda. Chapter Three (pages 48-87) deals with technology and is the largest chapter of the book. This keeps with the trend of the HDL line. The fiction of the settings are ably delivered with rich, but dense style. The author obviously chooses to focus more on providing stats for sci-fi gizmos and weaponry rather than detail all of the power plays in motion. And this makes sense as few game masters want a book to tell them who runs what. The first thing most groups do is make adjustments to the NPCs. What gaming groups tend to stick with are the rule and equipment details. Chapter four is a brief discussion of the U-Net, Perfect Horizon’s answer to the Internet and Big Brother rolled into one. There are story seeds in this chapter for using U-Net, including rules for Net Walkers, individuals who illegally enter and sometimes fight while in the digital form of their hacking ability. What cyberpunk setting couldn’t give a nod to the Matrix? Luckily, this is only one aspect of the game and could easily be ignored for the sake of a myriad of other storylines. Religion. Space exploration. Corporate espionage. The author offers an amazing amount of directions for games to visit using this setting. Chapter Five (pages 94-103) has some special rules for players that just don’t fit anywhere else in the book. It’s a bit erratic, but somewhat useful. Things like cost of living and possible pre-generated characters are available here. The final chapter (pages 115-119) is for the Narrator. Here readers find a little bit beneath the surface of the storylines along with some plot hooks to get their game rolling. I have to say that I like the various agendas within this game. 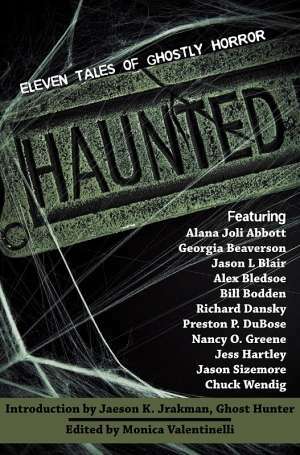 While I’m not generally a fan of this genre, some of the plot hooks are inspired and worth the effort to explore. While the previous supplement evoked the Matrix and Shadowrun, this particular supplement works from the Harry Potter (Hogwarts) and X-Men (Xavier Institute for Higher Learning) models. Players take on the roles of students at this fanciful school. This supplement is probably the most fun of the books as it reads like a school’s primer. Text in black is designed to be read as the “true” school manual while the blue text holds all the game jargon. This is a great idea, but the game doesn’t really hold to it. The last chapter strains the concept a bit too much. For example, when discussing some of the abilities various demons possess (Insubstantial, in this case), black text reads that such a creature “gains a +1 bonus to Hiding checks.” To most readers of the “school manual” this would be an odd concept. 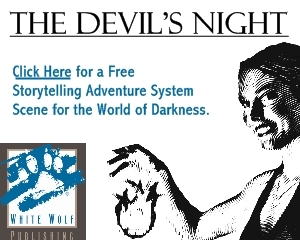 By the end of this chapter, the book pretty much goes full black text, meaning the fictional world uses the game’s mechanics as a means of categorizing demonic creatures. With the biggest pro and con to this book (the largest in the line), let’s back ourselves to the layout and artwork. The layout starts off strongly, but waivers as the book nears its end. I’m counting the color scheme towards this failing. The game’s artwork is fantastic most of the time. I especially liked the school’s seal and various icons of the many supernatural types that fill Demongate’s halls. The book is broken down into four handbooks, which are the student’s handbook, faculty handbook, curriculum guide, and demon world handbook. Only the first and third handbooks are intended for players. 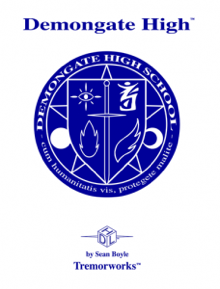 The student handbook outlines Demongate’s special character creation rules. There are some neat backgrounds and weaknesses available to remind players that they are playing younger, less experienced characters. An example of these is “parental pressures.” You can be all kinds of hero, but if you’re still answering to mom and dad, you have some serious limitations. Demongate is like any high school. Senior ridicule Freshmen. There are cliques to join; bullies to resist. Sean Boyle takes great care to recreate the high school experience through this book, right down to the school’s rules and responsibilities. You may save the world from a fire giant, but if your school uniform is charred . . . well, you better have a good explanation. The latter three handbooks cover the school faculty, a ton of plot hooks, demonic abilities, financial and political backers, demon races, and much, much more. Most of the demons are artistically sketched out to mostly satisfying degrees (I like the evil squirrel perhaps best). Between pages 78 and 139 are descriptions of enough monsters to handle the full high school experience for any PC. As a fan of high school settings mixed with the supernatural or paranormal, this supplements stands out as my favorite in the Tremorworks line. There is a ridiculous amount of avenues for players and narrators to explore, especially when mixed with some healthy imaginations and past high school experiences. Great stuff. Imagine a world where you can enter your dreams and the dreams of others. Now imagine that something else has also mastered this ability . . . and wants to undo you. You’re now looking at the intellectual kernel of what Lucid is all about. This game takes a very specific aspect of life and devotes a tremendous amount of energy to it. While Lucid is the smallest of the four reviewed books, it gets meatier and meatier as the read progresses. Lucid’s layout is as simple as the other books. By this point, I’d like to see things jazzed up some; however, it makes for a quicker read. The only other issue is the unexciting chapter headings. Without the table of contents, it is next to impossible to know what chapter you’re readiig in this book. Only the title lines the upper trim and only the page numbers dot the bottom. The artwork in this book once again shows the author’s love of anime and has hints of comic books mixed in for taste. In line with the other books, the artwork is mostly good by a sizable margin. The cover art to this book feels a bit like it’s the widescreen release to a movie, prompting me to read through this book first. Of the four books (all of which have nice covers), I enjoy Lucid the most with Demongate High coming in at a close second. The introduction gives readers a look into the diary of a teenage dreamer as she comes to terms with her newfound abilities. Her writing is in a cursive prose while typed notes at the bottom refer to the thoughts of a more experienced dreamer seeking to protect her. Having just read the first Twilight novel and managing just barely not to throw up at the sheer stupidity of it, I wasn’t too keen on peering into the mind of a teenager again. Luckily, Boyle’s protagonist isn’t the whiner that Bella Swan is and lasts for considerably fewer pages. Chapter One (pages 19-28) lets player create a Dreamer for the game. As in the other HDL games, there are some great backgrounds and weaknesses, such as Radiant Dreamer and Dream Pest, to make some truly detailed characters. There are also some new skills for dreamers, relative to their storylines. Chapter Two (pages 29-36) is entitled “Stepping into the Reality of Dreams.” Peppered with ideas on lucid dreaming and the surreal experience, this chapter explains the mechanics of the dreams. Various key charts fill this chapter as rules dictate how much dream “stuff” a skilled dreamer can alter. Also, in the vein of Freddy Kruger and urban legends, the veil between the waking and dreaming worlds is discussed. Will you die if you die in a dream? Probably. Chapter Three (pages 38-42) depicts the monsters of the dreamscape. This is where the game’s biggest weakness takes hold. Three creatures–shadows, nightmares, and terrors–are laid out. These beings are basically the same thing. Each one just happens to be a little bit more challenging than the last one in a fashion identical to the Billy Goats Gruff. With these creatures being the foremost threat to the dreamers, the idea of a long-term campaign gets cold quickly. There are other threats mentioned in the book (such as other dreamers); however, the third chapter only mentions these guys. Chapter Four (pages 43-53) is the narrator’s only section. It starts with the basic fare of getting groups together before offering another chunk of plot hooks. After that, the book winds down with a handful of NPCs. The primary NPC, Herald Harbinger, works to help new dreamers fight off the shadows. It is his amendments to the girl’s diary at the beginning of the book. An odd addition to his stats is a map. At first, I thought this was a horrible error; however, it belongs there as it is his dojo he uses to train the recruits. I’m not sure that the concept of a room required a map, but this book gives it to you. At the end of this chapter is a brief index, a character sheet, and something called the shadow sheet. This last sheet is a tool to handle combat between a virtual army of shadows. 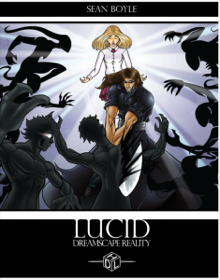 Lucid falls quickly as one moves through the book. There is no true back story. Even the game’s antagonists are too vague. Although it would be problematic at times, the most interesting way to keep one of these characters going would be through their inclusion in a Perfect Horizon or Demongate High game.